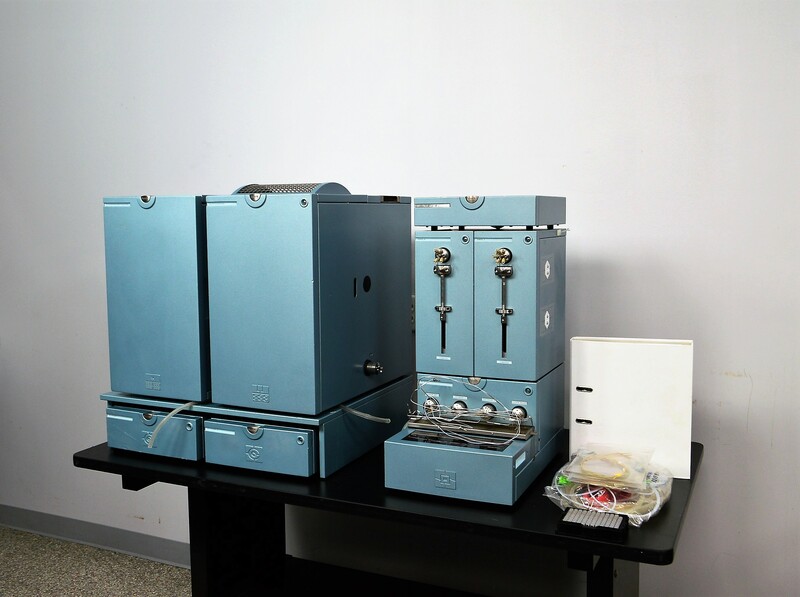 Spark Holland Symbiosis Pro System HPLC ACE Pump Autosampler Stacker Syringe SPE . New Life Scientific, Inc.
-Motors initialize when powered, sampler homes, pumps "ramp-up"
The Autosampler 930 and Conditional Stacker 931 were powered on and the motors underwent tension. The motor can be heard homing in the sampler and the LED flashes red. The unit are designed for combined use and are joined with a binder bar. The autosampler and stacker have only one power cable and two internal cables (disconnected for separating). The Automated Cartridge Exchange ACE Model 725 features two ISS valves and two clamp valves. The HPD syringe pump model 730 and powers on and the indicator light illuminated green. Unfortunately, the software required to control this instrument (Sparklink or Clarity) was not available and no additional testing was performed. The Spark Holland system is in excellent cosmetic condition and clean.